A design celebrating the flowers and greenery of Christmas. Small golden beads form the centres of the Christmas roses, and tiny white pearls represent mistletoe berries. 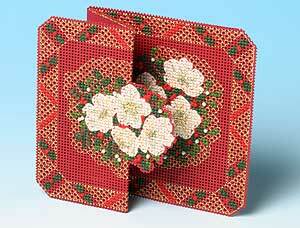 The perforated paper is a festive red, and the card stands about 12.5 cms high.